Is there a way to find the version of Magento being used without having access to server sided code? My thoughts are to check for LICENSE.txt or LICENSE_EE.txt. You can at least determine CE vs EE. You can also use the copyright year in the default styles.css to form a guess. Does anyone else know a better way? The copyright notice in /skin/frontend/default/default/css/styles.css is already a good indicator. However, there is no information about the exact patch version. Magento 2.0         Copyright © 2016 Magento. Magento 2.1         Copyright © 2016 Magento. If the store still has the Magento Connect Module installed and is not purposefully blocking that url from public access to can just access http://www.website.com/downloader the version will be shown at the bottom as per this image. Technically I think this is the version for the Downloader package, but i've never seen it not match the overall Magento version. You can use MD5 hashes of public files (images, css, js) to identify the version. This repository has a list of hashes for files in js, media, and skin folders. "a2c7f9ddda846ba76220d7bcbe85c985": "CE 1.2.1, CE 1.2.1.1, CE 1.2.1.2"
"d1bfb9f8d4c83e4a6a826d2356a97fd7": "CE 1.3.1, CE 1.3.1.1"
"d594237950932b9a3948288a020df1ba": "CE 1.3.2.3, CE 1.3.2.4, CE 1.3.3.0"
We see that the hash corresponds to CE 1.9.0.0. Note this may not work if the files are minified, patched, have different line endings, etc. Nope, it would be bad if it would be publicly posted. Security wise it is ok not telling everything to everybody. Sometimes frontend functionality will give you a good guess. Because some features are just implemented since edition x. Or paths are build in a manner which is especially for a version. Same goes with modules, if they have specific frontend functionality and routers pointing to them or class name usage, it can be easily guessed. Not the answer you're looking for? Browse other questions tagged magento-1 version or ask your own question. How http://magentoversion.com determines Magento version ? 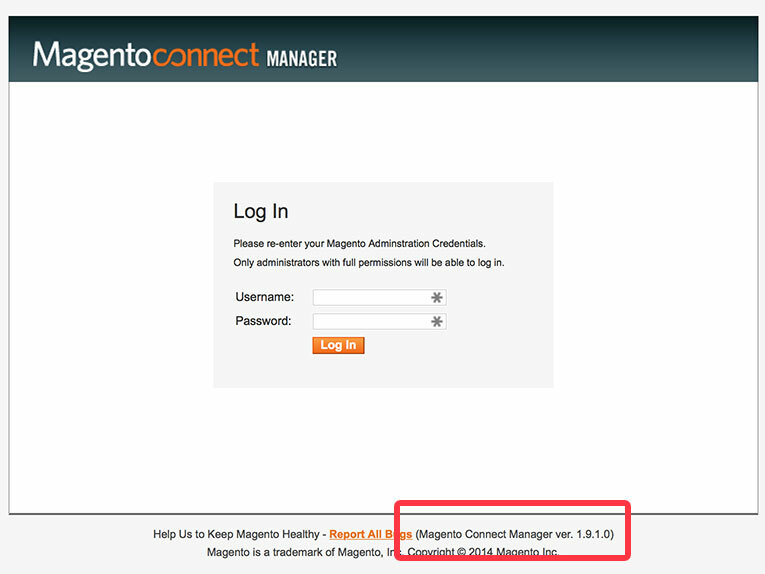 How can I confirm the version of magento? without have ftp access? What kind of risk will be there if Magento app/etc/local.xml file and release notes are publicly exposed? How to reveal Magento version by code? Which Magento version do i have? How to get Magento 2 latest version number available?